SJCA will engage students, parents, teachers, food service professionals, health professional, and other interested community members in developing, implementing, monitoring, and reviewing nutrition, health, wellness and physical activity policies. All students in grades TK-8 will have opportunities, support, and encouragement to be physically active on a regular basis. SJCA will provide nutrition education and physical education to foster lifelong habits of healthy programs, and related community services. SJCA will provide a safe and healthy school environment that ensures that students and adults are physically and emotionally safe. The wellness policy will be evaluated on an ongoing basis to measure the implementation and effectiveness of the policy. 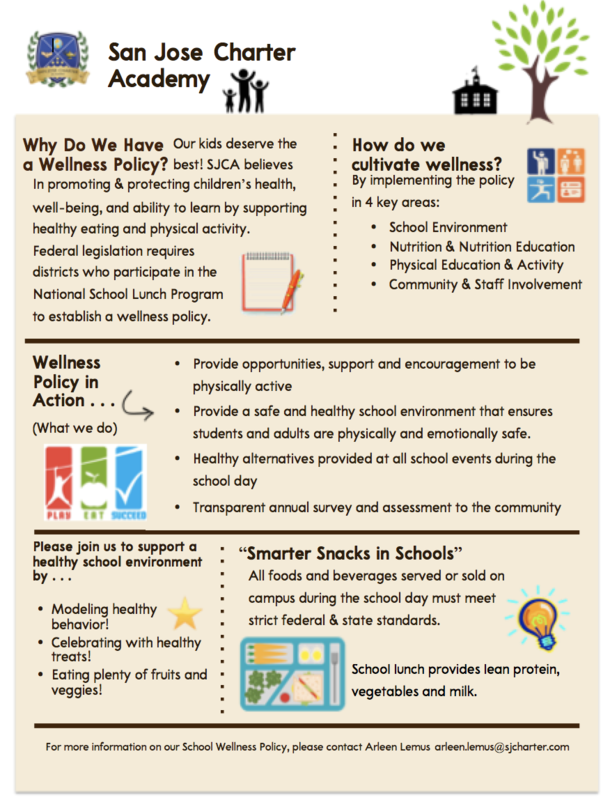 To view our updated School Wellness Policy, click on the PDF. For ideas on healthy snacks you can provide your child with for school, read below!